As I continue to winnow down the outdoor plants, I’ve managed to consolidate the containers in two areas where the remaining sun is. I do this for a few reasons. First, it gives color to a concentrated spot. Next, if I choose to protect any of the tender plants–or move them for a night or two–I don’t have to scramble to find them or worry that I’ve missed some. It also concentrates the watering chores. And finally, as the Spoiler gears up for his leaf blowing, he will begin to start whining that he can’t blow because my containers are all over the place and in the way. Funny how something that brought beauty all summer suddenly becomes a nuisance. Anyway, these are mostly out of the way of the blower and therefore out of the way of being beaten and battered into oblivion on a regular basis. Those of you that have followed me over the years know that you haven’t seen a lot of mums on this blog. As a general rule, I hate them (hate being a really strong word, but I do reserve it for mums). I can’t even tell you why I feel so strongly. It may have something to do with my years of retail gardening. “Do these mums match? Will these colors match my brick house? Why don’t you have any more of ____ color?” And on it went. It was the same thing with the annual geraniums in the spring, except it was worse with the mums because we were perpetually deadheading them. Anyway, mums and geraniums were my nemesis. I’ve gotten over the geranium thing because I get the fancy leafed kind. The mum thing, I still shudder every time I see them appearing in the fall! But this was a really nice pot and I know the Spoiler loves them so I indulged him. 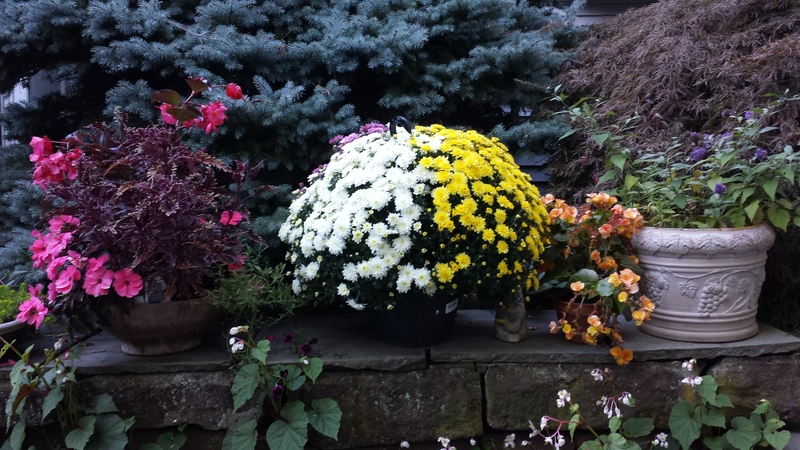 Here’s the wider shot where I have the mums. You see the begonia that I removed from the planter the Spoiler loved, drying out. The dracena is already inside. What’s interesting is that the begonia looked very autumnal until I got the mums there–now it looks very summery. 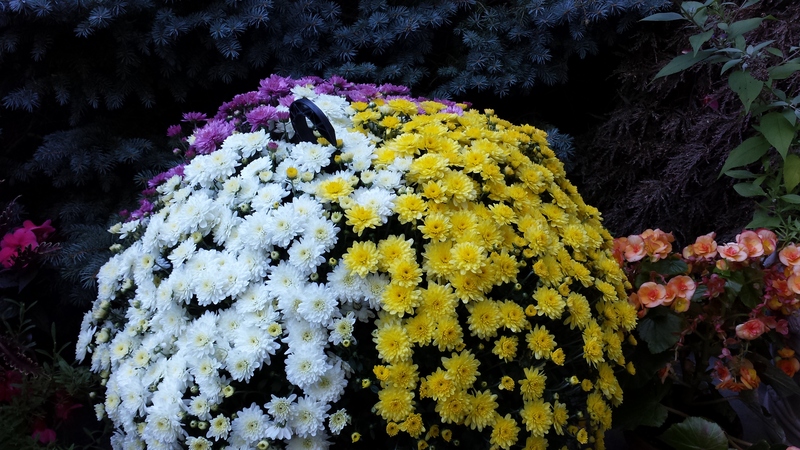 Maybe that’s why I don’t like mums–they don’t fit in my remaining color scheme–eek! They don’t match! I’m as bad as the rest of them! Previous Article It’s Time To Plant Bulbs When….